Snow fell all night long, covering the grassy hills with a deep white blanket. Jorge and Inga stayed inside their cabin, piling logs onto the fire. The smell of baking bread filled the rooms with a pleasant aroma. Smoke rose from the chimney, spiraling into the sky. Outside not a sound could be heard. Somehow snow had a magical way of silencing the hills. Jorge grumbled and complained, rubbed his hands together and stacked the chopped wood in the fireplace. He lit the fire and soon the chill was taken from the room. His nose twitched, smelling the aroma of cinnamon rolls and sizzling bacon. After filling up on porridge and the rolls and bacon, the two of them dressed quickly. They donned their boots, gloves, hats, scarves and heavy coats. Leaving the warmth of the cabin behind them, Inga and Jorge went outside. The icy man stood before them, its carrot nose dripping and it's mouth in a huge smile. “Hello, little snowman. How did this happen?” Jorge gazed at the coal eyes. “Why don't you come with us into the cabin and have a cinnamon roll?” Jorge reached for the snowman's hand. “He can't come inside. Brrr will melt. I'll bring one out for you.” Inga trudged through the snow and brought back a cinnamon roll. 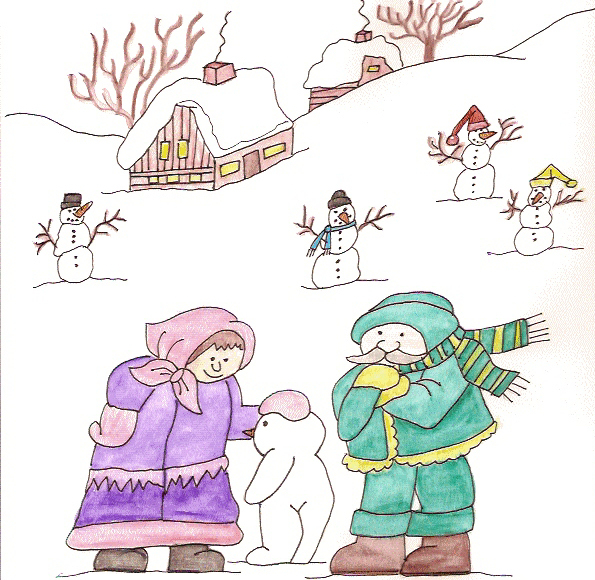 When Inga turned around, she saw that all four of the other snowmen had come to life too. Inga went back into the cabin and brought out cinnamon rolls for all the snowmen. She mended their torn hats and scarves and Jorge made sure all their coal buttons, eyes and mouths were polished and shiny. Inga replaced their wilting noses with new carrots. All day long they played with the snowmen. They played hide and seek, where it was nearly impossible to find a snowman! When the sun went down, Jorge and Inga bid their new friends a good night and promised more cinnamon rolls in the morning. Inga bounded out of bed when the sun rose and baked a fresh batch. The scent of cinnamon wafted in the air. She opened the door and took a tray outside. Her smile turned to a frown when she saw all five snowmen were just plain old snowmen again. None of them were alive. Jorge put his arm around his wife's shoulders. “It was magic snow, Inga. It only happens once in a lifetime.” They both stared at the snowmen and then went back inside, never to forget that winter's day when the snow fell, covering the hills with a blanket of white.